Although it is small in terms of land mass, the economy of the United Kingdom (U.K.) is prosperous. The British (U.K.) pound sterling (or pound) plays an important role in the international financial markets; therefore, investors may want to consider trading it in a pair against the U.S. dollar. For more than a century, the United Kingdom was the most powerful nation in the world. The U.K.'s economy was the world's largest, and the small island nation dominated international trade. During this time, the British pound served as the world's reserve currency. Following the World War I and II, the United Kingdom entered into a period of relative decline as the United States ascended to the position of the world's dominant economic power. The U.K.'s growth also stagnated as heavy government regulation and rigid labor markets impeded economic activity. The GBP/USD is one of the most liquid in the currency market. Bid-ask spreads are tight, and arbitrage opportunities are unlikely to exist. However, the liquidity of the pair combined with the availability of trading instruments makes the GBP/USD an excellent choice for all types of currency traders. As with the euro/U.S. dollar, the most important factor in determining the relationship between the U.S. dollar and the British pound is the relative strength of the countries' respective economies. 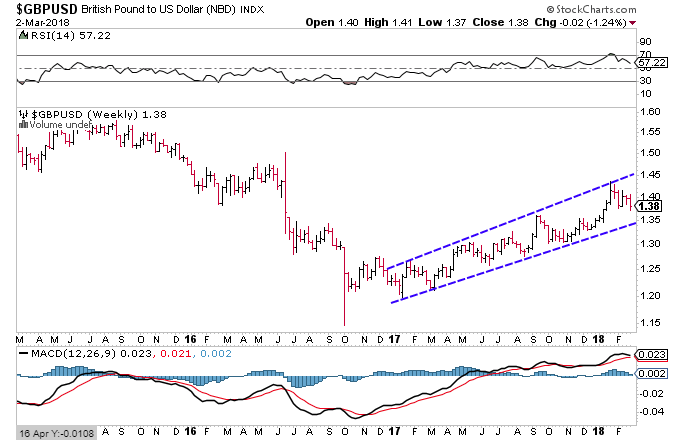 When U.S. economic performance is stronger than the U.K.'s, the dollar usually strengthens against the pound. When the U.K.'s economy outperforms that of the U.S., the dollar generally weakens against the pound. This relative strength is often reflected in domestic interest rates, so traders should look carefully at the relationship between U.S. and U.K. interest rates. Because both the U.S. and the U.K. boast very large financial hubs, the performance of the countries' financial sectors and financial markets can also be important in explaining relative currency movements. Find out why Brexit could threaten the short-term stability of the British pound sterling and the euro, and why the U.S. dollar stands to benefit. The United Kingdom has one of the strongest economies in the world thanks to the strength of its services, manufacturing construction and tourism sectors. Some investors are seeing this as a historic opportunity to buy UK property at bargain prices. These four major currencies have seen some wild swings in the floating market since 1990. Learn what the Brexit is, and several likely consequences if it occurs. Discover three exchange-traded products to avoid if the Brexit takes place.